Last week, four influential female leaders gathered and discussed leadership on stage at the Professional Women’s Alliance. 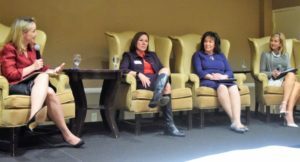 Led by Susan Anable, Vice President of Public Affairs with Cox Communications, the panel described what characteristics defined an influential leader. “An influential leader is someone who can influence and inspire someone to do better,” said Sharon Harper, President and CEO of The Plaza Companies. Harper stated that a title doesn’t make a leader. Rather, it’s how a person acts and is perceived that defines his or her leadership. Often times when people think of leaders a certain profession or status comes to mind, but according to Harper, a leader can be anyone and the influential ones often don’t fit the typical mold. Wendy Briggs, director at Veridus, a lobbying firm in Phoenix, added that being a leader can be very simple. “Doing what you say, living your life with integrity and being present in all situations are all things that exemplify a great leader” said Briggs. The panel of all female leaders continued to expand and highlight what makes a person a leader, and how someone can define their own leadership style. As the discussion concluded the leaders—all power brokers in their respective industries—shared their stories of leadership and how they challenged the status quo to lead. The next Professional Women’s Alliance will be on Tuesday, February 13 featuring Carrie Young, Senior Director of Corporate Operations Services of SRP. Carrie will share her unique career journey including her transition from the military into the civilian workforce.